My friend Cath got this book for Christmas from her sister and it is the funniest thing. 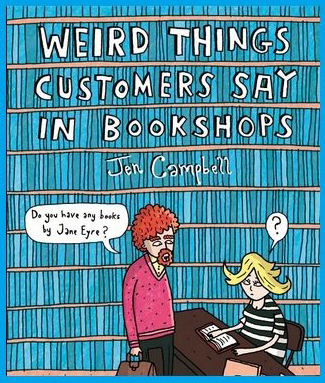 It is a collection of "Weird Things Customers Say In Bookshops" and it is written by Jen Campbell. It seems the idea started as a blog. Customer: Hi, if I buy a book, read it, and bring it back, could I exchange it for another book? Me: No... because then we wouldn't make any money. Boy: When I grow up, I'm going to be a book ninja. Me: Cool! What do book ninjas do? Boy: I can't tell you. It's top secret. Ha ha, I need a copy of this for sure!